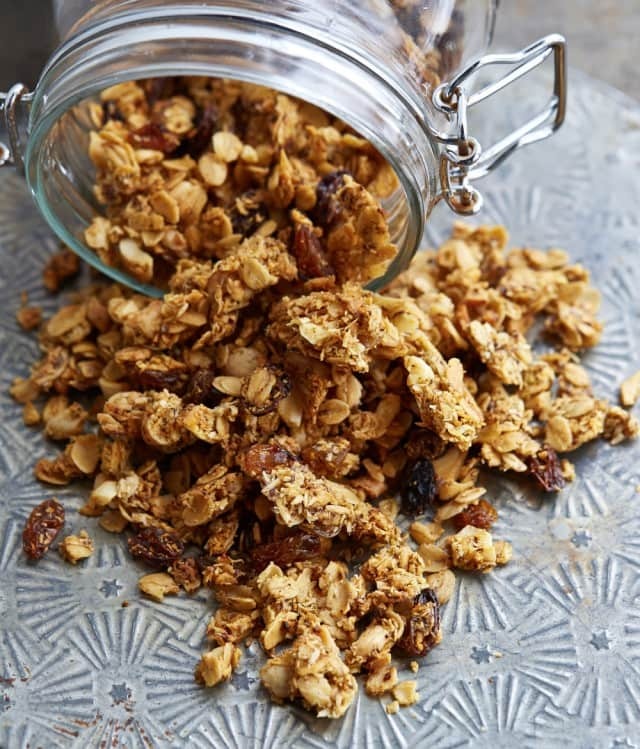 Granola is one of my favorite things to have on hand for a quick breakfast or snack. I really enjoy creating granola recipes – I made some tasty ones for my new book including chocolate hazelnut and bourbon pecan. I also branched out into some savory granolas – and have fallen in love with those too. I’m sharing the recipe for Curry Cashew Savory Granola and it’s amazing on plain coconut or soy yogurt. Savory granola is great as a salad topping, sprinkled on pasta or as a snack by the handful. You could try making a vegan yogurt dressing with some garam masala and throw in some cooked garbanzo beans to make it a well-rounded meal topped with this crunchy topping. One of the reasons I love curry is that it blends spices used in desserts with savory and fiery flavors. Because of that, this granola straddles the line between savory and sweet. piece about 1/4 to 1⁄8-inch thin. Bake for 20 to 25 minutes, until the edges are browned and the middle is no longer wet. Let cool on cookie sheet and break it up into large or small chunks with your hands. Use to top salads or plain yogurt, or just eat by the handful for a snack! « Super Easy Tofu Stir-fry Using a Kale Salad Kit! Love all the spices in this one, especially the mustard! Uh, I got new glasses a few months ago, and no matter how closely I look at this recipe…I can’t find ANY curry in it. What the…??? Garam masala is a curry spice blend. Curry is a blend of spices. There are many variations depending on the region the curry (spice blend” comes from. Most famous are Indian Curries such as Garam Masala, Vindaloo, or Rogan Josh. There are Southeast Asian curry blends as well. These include Red, Green panning and massaman, ones from Thailand. I know there are others, but I am not familiar with them. But basically the word “curry” is a catch all for a spice blend, and not a single herb or spice. But then there are also “Curry leaves” that are used in East Indian (and maybe other) cooking. But curry leaves used alone in a recipe will not impart the complex flavors that the blended spices, such as those mentioned in this recipe, provide. Curries range from mild o very hot, depending on the spice levels. Is the shredded coconut sweetened or unsweetened? Unsweetened is what I use.